Should President Trump be allowed to block someone on Twitter? President Donald Trump's fondness for criticizing news organizations, "heckling journalists" and spouting points of public policy via his Twitter account is clear. News of his nomination of Christopher Wray to be the next FBI director, for example, came by tweet. 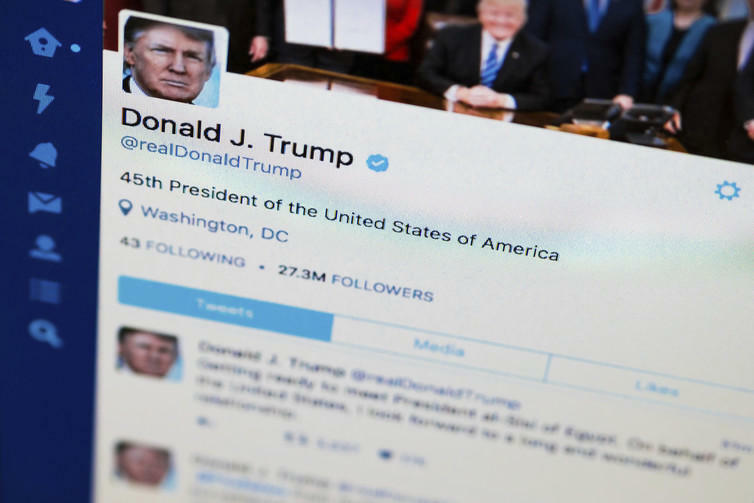 His tweets carry the stamp of government authority: White House Press Secretary Sean Spicer recently declared "the president is the president of the United States, so they are considered official statements by the president of the United States." But just as seemingly everything Trump does and says sparks controversy, so too is the president's "prolific and unpredictable use of Twitter," as one reporter called it, raising a novel question of constitutional law: Is there a First Amendment right to access Trump's Twitter account? "When you block an account on Twitter, you restrict that account's ability to interact with your account. It can be an effective way to handle unwanted interactions from accounts you do not want to engage with. Accounts you have blocked will not be able to view your Tweets, following or followers lists, likes, or lists when logged in on Twitter, and you will not receive notifications of mentions directly from those accounts. You'll also stop seeing their Tweets in your timeline." Now Columbia University's Knight First Amendment Institute, which is dedicated to protecting free speech and free press, is threatening to sue Trump unless he unblocks "the Twitter accounts of individuals denied access to his account after they criticized or disagreed with him." "Blocking users from your Twitter account violates the First Amendment. When the government makes a space available to the public at large for the purpose of expressive activity, it creates a public forum from which it may not constitutionally exclude individuals on the basis of viewpoint." Does this argument hold water? As director of the Marion B. Brechner First Amendment Project at the University of Florida, I study just this kind of question. Here's how the case against Trump's blocking unfolds. Initially, the First Amendment protects free speech and the press from government censorship, as well as the right of citizens to petition the government for a redress of grievances. When people complain to Trump on his Twitter account about his policies, they not only are engaging in free speech, but also are petitioning the government. The First Amendment, however, doesn't address or prevent censorship imposed by private individuals and private businesses. Twitter is a private entity, but because Trump is a government official, the First Amendment applies. In essence, according to this argument, when Trump blocks people from interacting with him on Twitter, he plays the role of government censor preventing people from speaking and petitioning the government. In addition, the First Amendment prohibits viewpoint-based censorship of speech. This means that the government cannot favor or suppress sides on any given issue or topic. It cannot allow one viewpoint to be expressed but not another. For example, a law permitting only pro-life speech on the topic of abortion and banning pro-choice expression is viewpoint-based and thus unconstitutional. When Trump blocks access to his Twitter account for those who disagree with him but permits access for those who agree with him, he is engaging in viewpoint-based censorship. Third, the rule against viewpoint-based censorship applies when the government (in this case, Trump) creates what is called a public forum for speech. There are two main kinds of public forum. The first – called a traditional public forum – is easy to understand. These venues include physical spaces such as public sidewalks and public parks where speech, such as rallies, protests and concerts, have occurred for many decades. Twitter clearly is not such a traditional public forum. The Knight Institute, however, argues in its letter to the president that Trump's Twitter account constitutes a designated public forum, a space created by the government specifically for speech. Imagine, for instance, a bulletin board inside city hall or a courthouse where people can post flyers about upcoming events. Essentially, Trump's Twitter account is akin to a virtual bulletin board. People who are blocked cannot respond directly to him. They cannot, by analogy, use the bulletin board. "surely didn't contemplate presidential Twitter accounts, they understood that the President must not be allowed to banish views from public discourse simply because he finds them objectionable. Having opened this forum to all comers, the President can't exclude people from it merely because he dislikes what they're saying." But is his Twitter account a designated public forum? This is the tricky part of Knight's case against Trump, were it to file a lawsuit. Twitter has more than 300 million active users each month. It is a vibrant, virtual space where people – Trump included – engage in often robust discussion about political issues. Trump's first address to Congress, for example, spawned more than three million tweets. By these measures, it's a modern-day public forum, yet it's not run by the government. Trump's own account, however, is run by the government – namely, himself. That's the argument that the designated public forum label applies and, in turn, that Trump's blockage of users based on their viewpoints is unconstitutional. Any claim that @realDonaldTrump is his personal account (not his official one, @POTUS) and does not represent the government has been conceded by the White House already: Remember Spicer's statement that Trump's tweets are "official statements by the president of the United States." If Trump does not comply with Knight's request to unblock users, Knight may sue. That would give both Knight and Trump the opportunity to break new First Amendment ground on public forums in the digital era. And if Knight prevails and expands free speech rights to clarify that government officials on Twitter can't block interactions with other users, it would be a most ironic outcome for a president who often takes aim at the First Amendment.